Use a plunger measuring cup for the mayonnaise. 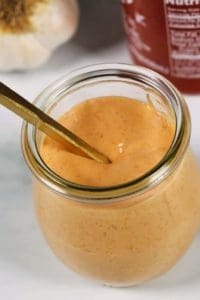 I love this using plunger measuring cup for ingredients like mayo, ketchup or peanut butter. It's so easy. This recipe can easily be doubled. We go through a lot of this Boom Boom Sauce at my house. I usually make a double or triple batch so that I always have it on hand. Store extra sauce in a jar with a tight fitting lid. I love using these jars . For best results, make this Boom Boom Sauce several hours ahead of time. It gives all of the flavors a chance to become with each other and amp up the deliciousness factor. The longer it sits, the better it is.